2. Open the file called pBR322 in the Tutorial Files folder by choosing File > Open… . 3. Choose Edit > Find > Find.. . to bring up Figure 2.91. 5. The search dialog used in Find Sequence is case sensitive, allowing precise control over the search process. Nucleotides entered in UPPER CASE in the search string must exactly match the target sequence (i.e. conserved regions). Alternatively, nucleotides entered in lower case can be used where the sequence may be allowed to have mismatches, and the maximum number of mismatches allowed for those characters can be defined in the query. Find can also accept ambiguous characters (N, Y, W, B, D, etc.) 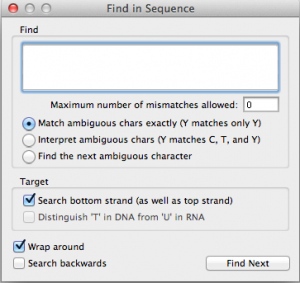 in the search string – useful when a target sequence has nucleotide variances. A table of Legal Nucleotide Characters which can be used can be found in the Appendix (page 9-1) of the GCK manual. The check boxes allow users to also define whether only the top strand (or both strands) should be considered, and whether the search should wrap around to the beginning of the sequence after each match is found. This allows you to find sequences that span the origin in circular constructs. 6. After setting any additional parameters you wish to try out, press the Find Next button to initiate the search. 7. The result should be that nucleotides 4156 – 4260 have been found, and are highlighted on the construct. This concludes the tutorial. Close the pBR322 file, but do not save any changes you may have made so that others may work with this sample file in the future. This entry was posted in gene construction kit tutorials and tagged DNA search, Find Mismatches in Sequence, Find Sequence, Gene Construction Kit Tutorials. Bookmark the permalink. Trackbacks are closed, but you can post a comment.